Marco Stanley Fogg is an orphan, a child of the '60s, a quester tirelessly seeking the key to his past, the answers to the ultimate riddle of his fate. As Marco journeys from the canyons of Manhattan to the deserts of Utah, he encounters a gallery of characters and a series of events as rich and surprising as any in modern fiction. Beginning during the summer that men first walked on the moon, and moving backward and forward in time to span three generations, Moon Palace is propelled by coincidence and memory, and illuminated by marvelous flights of lyricism and wit. Here is the most entertaining and moving novel yet from an author well known for his breathtaking imagination. 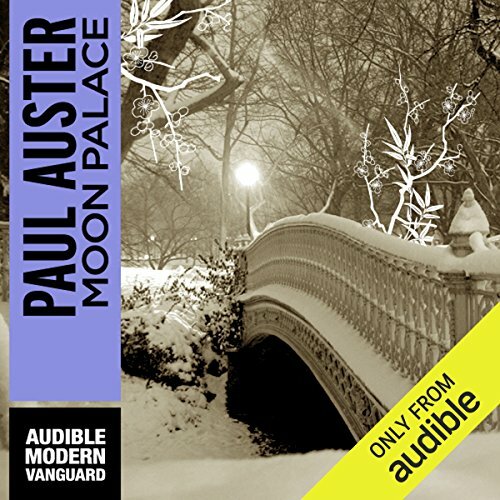 ©1990 Paul Auster (P)2009 Audible, Inc. While this book starts well, it soon goes downhill. The central character in the beginning is Marco Stanley Fogg. He drew my attention. What happens to him gives the reader a lot to think about. He is an orphan and has no relatives. He is totally alone, or so he thinks. Until..... Well, I am not going to tell you. And he is broke. When? 1969. Where? Brooklyn. I liked the writing. I liked the philosophical thoughts, his thoughts about writing, about travel, about how people interact, our need for connection with other human beings, all of this I found interesting! Then he meets Kitty. I liked her too. However the further you proceed, the further the focus shifts from Marco to others. Mostly it follows an elderly man, Effing. He is 84 in 1969. But who is Effing? First their stories are woven together, but then the Effing personality takes over. His story? Well it is crazy, as far as I am concerned. His story goes on and on, and on and on. It‘s too long, goes off on all different tangents, none of which were either credible or interesting. One example, to be specific, are the pages and pages and more pages about a book written by Effing’s son. Yes, there is a connection between Effing and Marco, but that connection is in no way credible. At least two thirds of the entire book left me totally unengaged. Little to think about. How is it possible to be engaged in a story that is beyond belief? In addition, this part of the book turns into a movie script. The narration by Joe Barrett is absolutely excellent. I enjoyed Timbuktu very much, but Moon Palace is unwieldy.